Last year was the first year we planted a full garden. My friends, Christine and Aaron, worked tirelessly to till the soil, weed, and plant vegetables and flowers in our backyard beds; I’m so grateful for them, as my body can’t do the necessary bending and squatting. 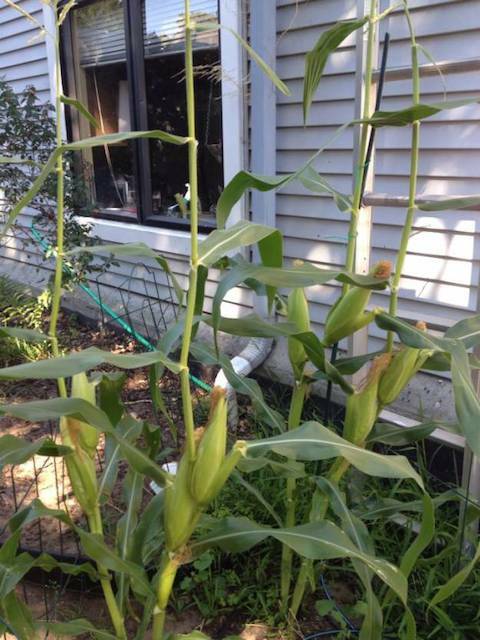 Our growing garden brought me hours of delight; I enjoyed the task of watering (that much I could do!) and watching all the plants mature and begin to bear their “fruit.” We enjoyed tomatoes well into the Fall; I made fresh salads from the lettuce and herbs; our most surprising success was with the four corn stalks we planted, never expecting such a fantastic little crop. 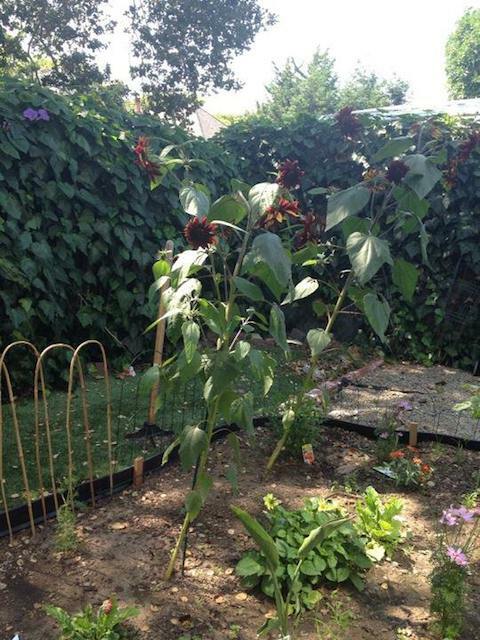 The only plants that didn’t do well were our foxgloves. We put in three, each a different color; one of them did not survive the planting. We removed it and planted another. 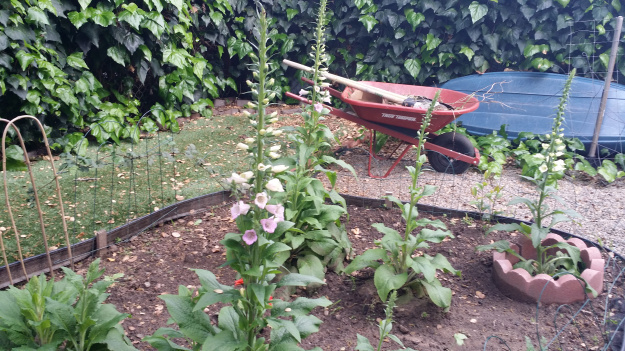 The three foxglove plants at the back of the flowerbed limped through the season, each sprouting a small stalk of flowers, but never really taking hold and growing into their full glory. I was bummed because I really love plants that grow tall and have multiple flowers on a stalk — each bloom its own beauty adding to the stalk’s lovely bouquet. They grow tall, reaching for the sun, with each flower a trumpet, calling forth worship to its Creator. Yeah, I love foxgloves. The rest of the flowers did so well that I didn’t mourn for long. We had the most gorgeous sunflowers that seemed to turn into sunflower “trees,” each stalk bearing about a dozen of those big, beautiful ladies, all in view from the window above my kitchen sink. Winter came and most of the plants died. We had a bit of an early spring and I noticed a few plants maturing in the flower bed that I was sure we hadn’t planted last year. 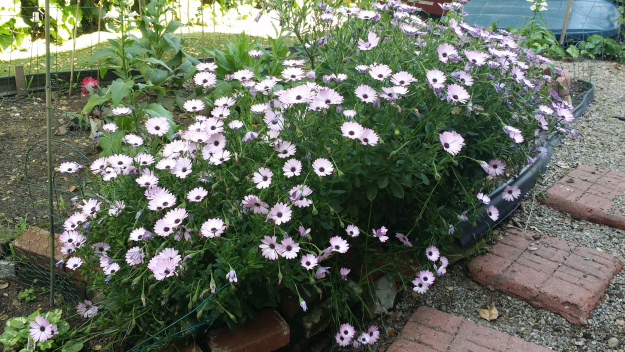 Several of the flowers wintered over — the gerbera daisies are in bloom now and the African daisies became a huge bush of lavender lovelies, enjoying their second season in our yard. But I had no idea what those other plants were; maybe they were weeds? They kept maturing, and getting bigger, with huge, sturdy foliage. There were so many of them, too! Soon there was a small stalk growing out of the center of most of those plants. I wondered for a moment, but I was busy with school and not really paying much attention to the garden. the corner of the bed (it predated us) and put in a callalily, which is already providing us with its graceful blooms. And now most of them are blooming — light pink, white, deep purply-pink. Healthy. Vibrant. Huge. Some don’t have a stalk yet and I’m eagerly waiting to see which colors will burst forth. The flower bed looks like the beginnings of a small foxglove forest, each bloom trumpeting rebirth. Apparently last year’s failed foxgloves, with some help from the wind, scattered some seeds which took hold. How many things I have “planted” over the years that have not done well? I have failed on many important fronts and wish I could rewind and have some do-overs. Failure is anathema in our culture; we idolize success. But God has other ideas. The same Spirit that raised Jesus from the dead lives in me…lives in all of us who proclaim “Jesus is Lord.” If I hold my failures up to God, and surrender them to Him, the wind of His Spirit will plant something new, something stronger, something that will glorify Him far more than my own efforts and successes. Sometimes it’s nothing anyone else can see; the new growth is often hidden in my relationship with Him. More gratitude, more worship, more peace, more trust, more love. As I look out my kitchen window, I see flowers, yes. I also see mercy. Nina Wichman is a 52-year-old Child of God and Follower of Jesus; wife of Glenn, mother of Caleb and Jake, owner and snuggler of Dweezil. She is also a former Worship Pastor, now moving into the ministry of Congregational Care and Spiritual Companioning, combining counseling, healing prayer and spiritual direction for the care of souls. 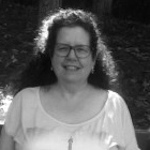 Finding a newfound joy and freedom in life, she enjoys sharing the ups and downs of the journey with fellow travelers. 5 replies to How Did My Garden Grow? Thank you, Nina…this is a lovely picture of resurrection and beauty in life. So glad you shared how this unfolded right before your eyes. It is beautiful on Lake Michigan today…your entry gives me hope for God’s glory to bloom very soon! Failure is anathema in our culture; we idolize success….what a true statement. I love the beauty that surprised you in wake of what felt like failure and loss. Thank you for sharing it with us. “If I hold my failures up to God, and surrender them to Him, the wind of His Spirit will plant something new, something stronger, something that will glorify Him far more than my own efforts and successes.” Bless you Nina for these words of hope…life. And you are so right when you write, “God has other ideas.” Thank you for this encouraging and lovely entry. I feel like I have just been into the wonder of summer and beauty – in myself and in my gardens.